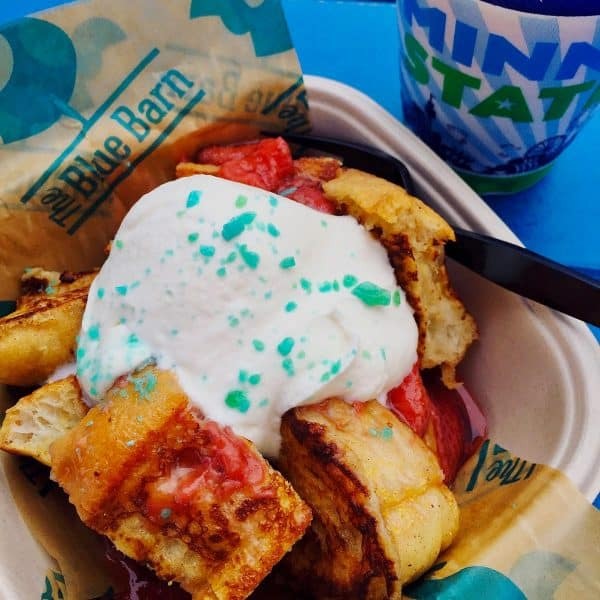 The Best Minnesota State Fair Food and Drink…according to us! 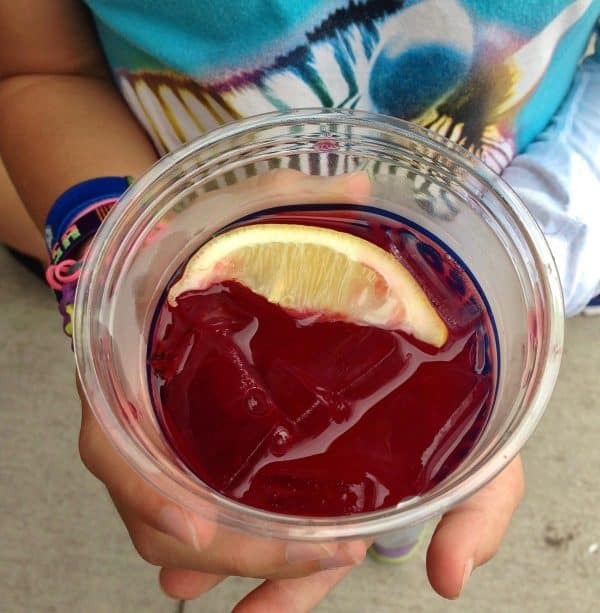 We’ve been attending the fair for 20 years in a row, and these are our favorites. 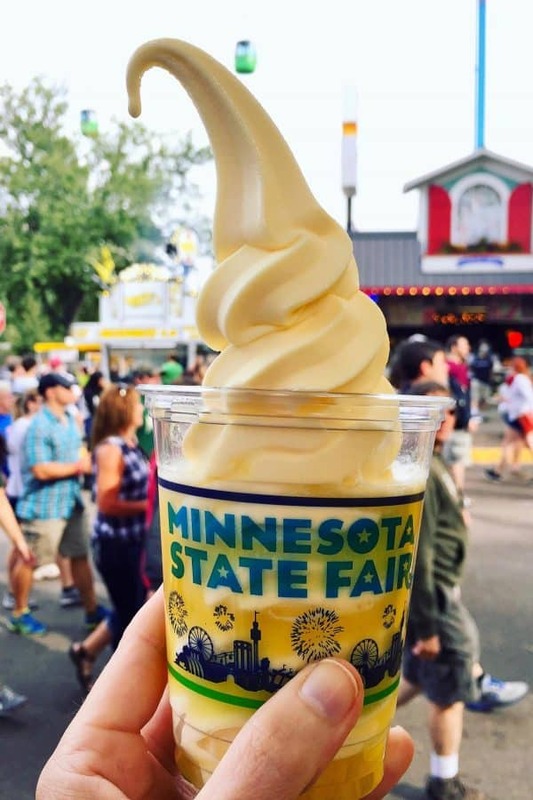 This is our list of the Best Minnesota State Fair Food and Drink. And when I say “best”, I mean our family’s favorites. I’ve been thinking about writing this post for at least a few years. 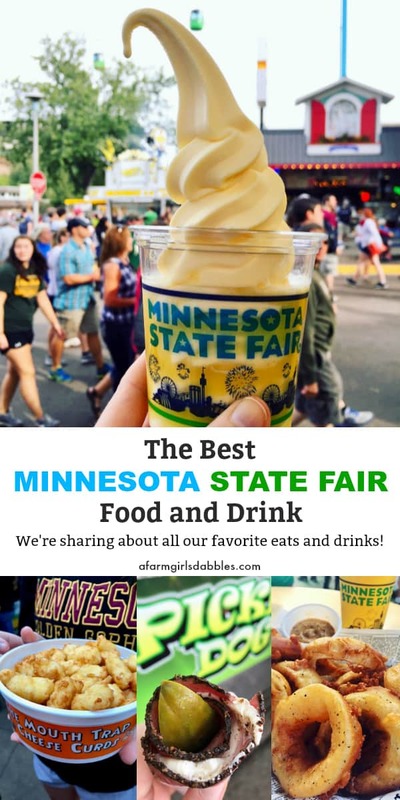 To have a place to direct friends and family and Minnesota State Fair goers, when they inquire about our family’s favorite eats and drinks at the fair. Attending the annual Minnesota State Fair is a tradition in our family. Blake and I walked through the gates together for the first time back in 1999, just a few weeks before we were married. And we haven’t skipped a beat. This year will mark our 20th year in a row, attending together. Also. 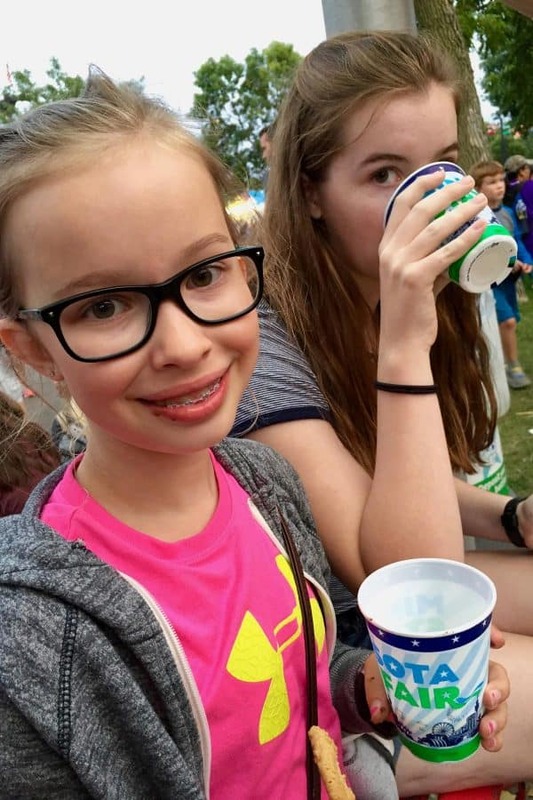 Our two daughters, now sixteen and eleven, have been to the fair every single year of their lives. They’ve graduated from being pushed in strollers, to leading us around the fair. We love The Great Minnesota Get-Together! We are mostly a traditionalist kind of family when it comes to state fair foods. Which means that, as a family, we’d never consider skipping out on our favorite greasy cheese curds, a footlong corn dog (no Pronto Pups for this family! ), or the items we’ve fallen for at The Blue Barn. But beyond the food traditions that have stood the test of time for us, the fair does a crazy awesome job at continuing to lure us with tasty new things to eat. And each year, we make a point to try at least a few new foods. 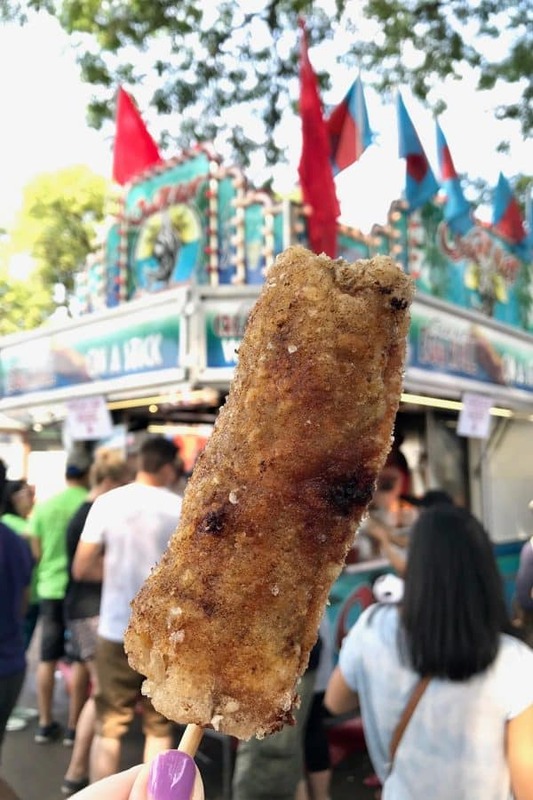 This year, the fair will debut 5 new food vendors and 27 new fair foods >> check out this year’s Minnesota State Fair new foods. 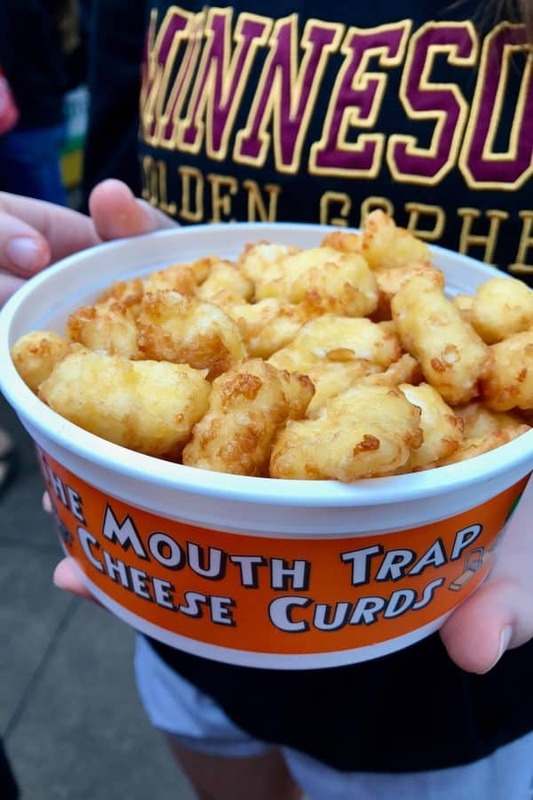 While we will never be able to say we’ve tried every single food item at the Minnesota State Fair, these are the items we have tried, and will definitely eat again. You won’t find anything on this list that we wouldn’t eat again ourselves. 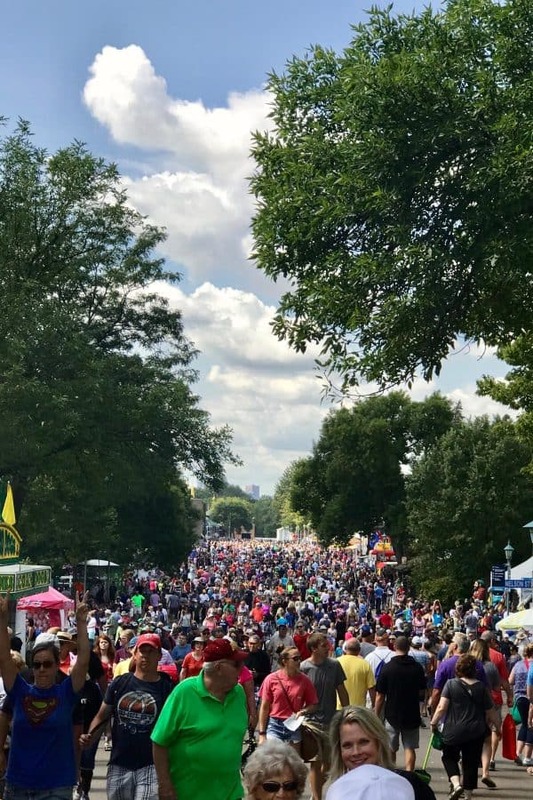 First, be sure to bookmark or save this post to reference from your phone during your visit(s) to the Minnesota State Fair. This food map will help you find all our favorites! I will do my best to keep this post updated from year to year, adding in new favorites and deleting those that we no longer deem worthy. 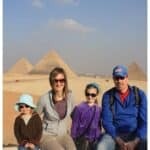 In each category, I have listed our favorite finds along with a short description. Nearly all of the photos were taken by our family, except where I’ve noted otherwise. Items are listed in no particular order, although the names of concessions on the Google Map are listed alphabetically. So let’s go. Here are our go-to fair favorites! 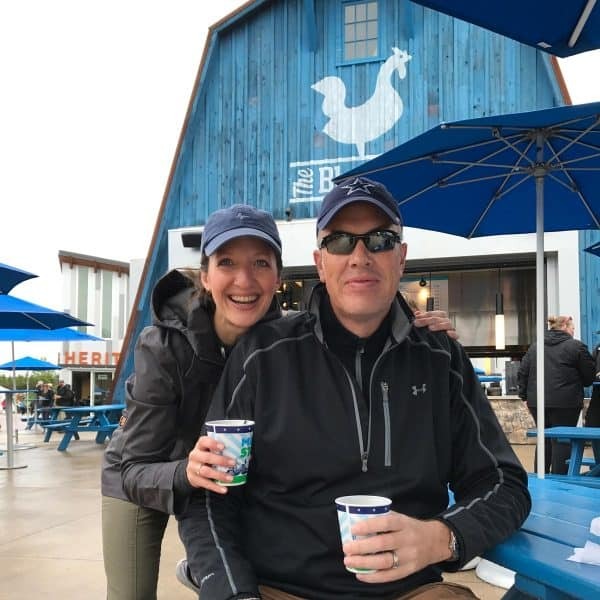 If we visit the fair bright-and-early, with coffee and breakfast fare on our brains, we normally head straight to The Blue Barn. This concession has become a family favorite, and it tempts us to visit morning, noon, and night. Blake and I grab a coffee, our girls grab an order or two of French Toast Bites, and our day begins. 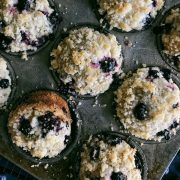 These bites are a particular favorite of our youngest daughter Tessa. 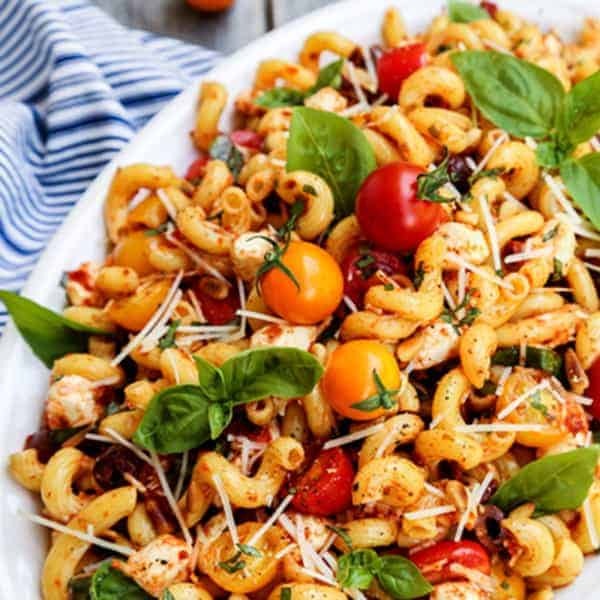 We usually order more than one serving to share, and enjoy them any time of day or night. They’re not just for breakfast! Little eggy ciabatta bites of French toast are topped with a berry sauce, whipped cream, and Pop Rocks. This longtime Pop Rocks fan (me) wholeheartedly approves of a second helping! This food was new to the fair last year. And I ate one of these egg rolls three of the four days I visited. I’d list it as one of my own personal favorites. This is a traditional deep-fried Vietnamese egg roll. Except that it is HUGE, the filling is heavy on the pork, and it’s served on a stick. With a sweet and tangy sauce for dunking, these savory, perfectly crispy (and nicely greasy!) egg rolls are gone in a flash. Minnesota Turkey is celebrating their 60th year at the fair this year. And if you haven’t yet tried this jumbo sammy, I beg you to do so. 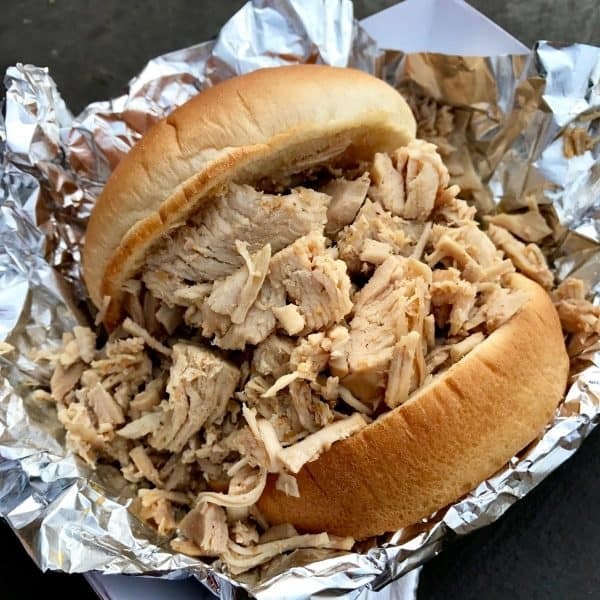 A large, squishy-soft bun is LOADED with tender, flavorful shredded and chopped turkey. 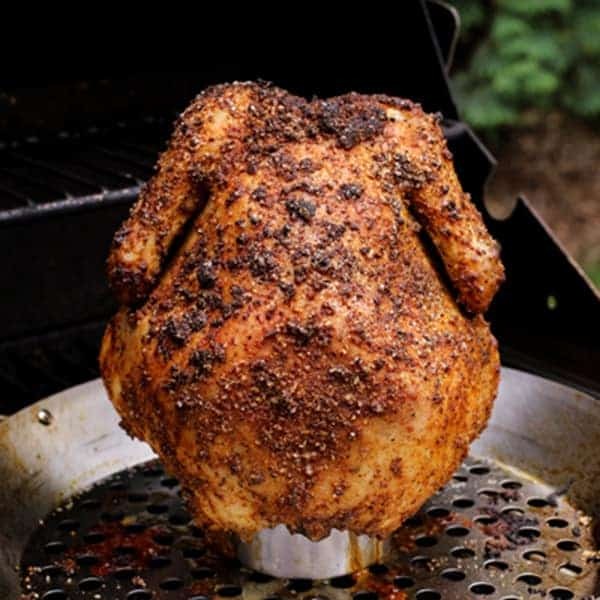 This is great for when you’re looking for something that’s filling and not fried. 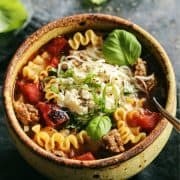 I like it with a bit of BBQ sauce, and I don’t even try to eat this without a fork and knife! This little sweet treat is the best value at the fair. When our oldest daughter Hatti was very young, touring the fair mostly via stroller at the time, she found marshmallows dipped in chocolate. And on their own little stick, in true fair fashion. Hatti has insisted on these every year since. You’ll also find many other treats at this confectionary booth, as well. Another cheap eat, and one that is especially wonderful when the temperatures are high. Basically, this a freezer pop…but instead of fake fruit flavors, this is made from local Minnesota apple cider. 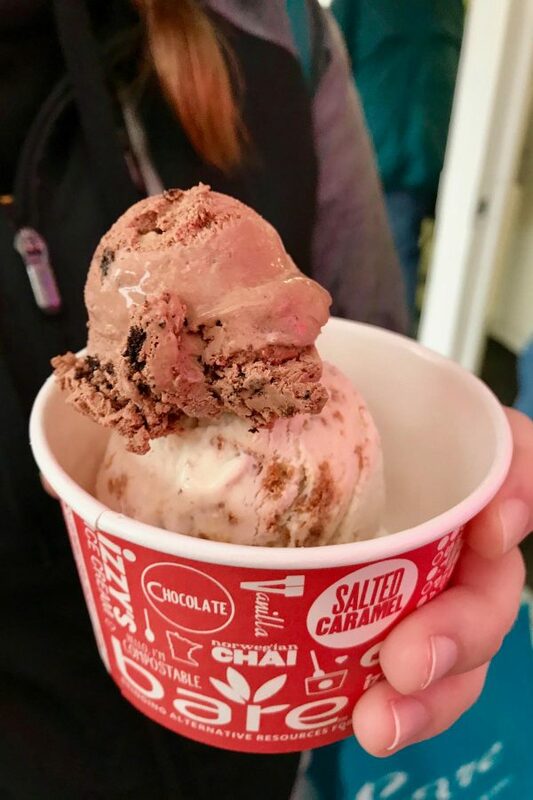 It’s a delicious way to cool down! Also find other Minnesota apple treats here, including cider and apples dipped in caramel. 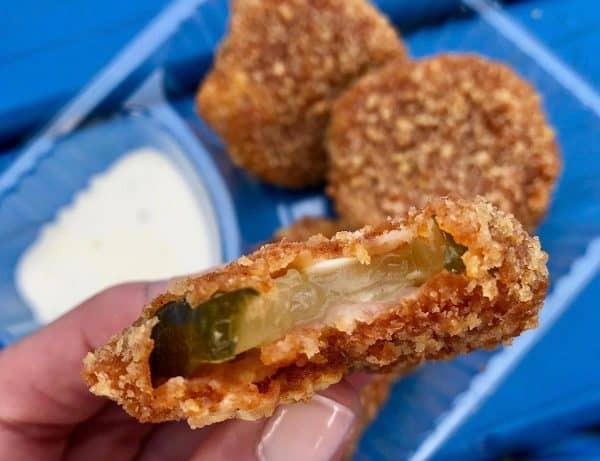 Big slices of puckery dill pickles are dipped in batter and then deep-fried until crispy. We like to eat ours dipped in ranch. Find it at: The Perfect Pickle, in the bright green concession trailer at the corner of Liggett Street and Dan Patch Avenue. Next to the Midway entrance and Heritage Square. Can’t get to the fair? Try my recipe for fried dill pickles! 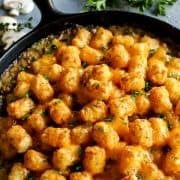 These salty, gooey, crispy nuggets of pure cheese awesomeness are A MUST for our family. And we never order cheese curds from any other place. If you’re 21+, I highly recommend walking across the street from this place to grab a cold, crisp brew from the Leinie Lodge to wash them down. The girls and I are big fans of kombucha, so this was an awesome find last year. We returned to this stand several times over the course of our visits. 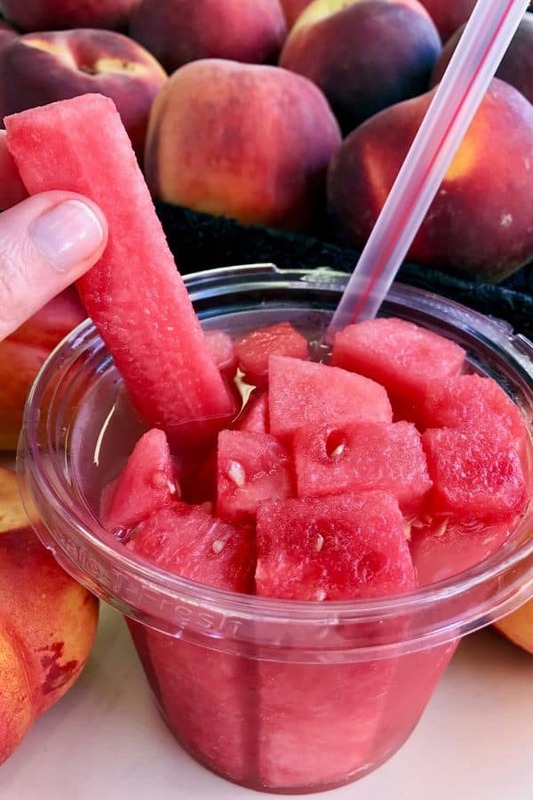 Fresh spears of watermelon (other fruits are available) soak in a chilled kombucha of your choice. It’s ultra refreshing. Go here on a hot day to cool down! Blake and Hatti own this favorite in our family. I tried it the first year, and it’s just “too much” for me. But to each their own. 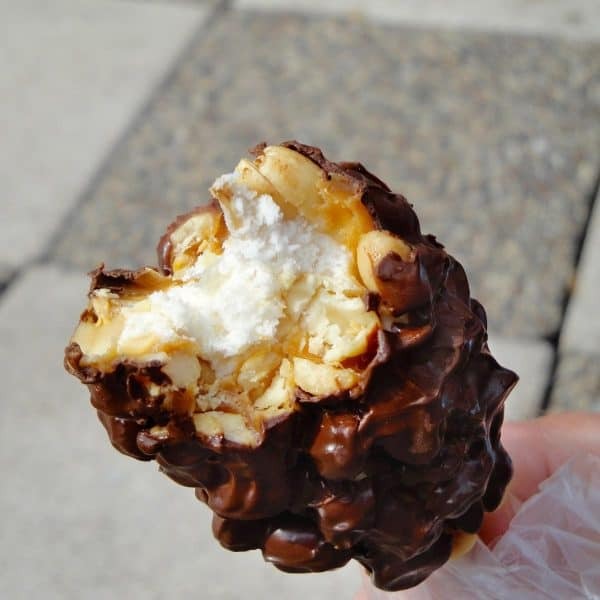 Candy bars are battered and then deep-fried, served on a stick with a sprinkling of powdered sugar. It makes me so happy to know I can enjoy this each year at the Minnesota State Fair, especially on a hot day! It’s rare to find this frozen treat outside of Walt Disney World and Disneyland. Frozen pineapple-flavored soft serve is swirled into a tall glass with cold pineapple juice. 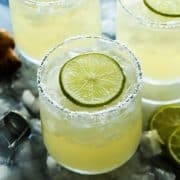 It’s sweet and refreshing and a bit tropical. And if I close my eyes, I can imagine I’m actually at Disney World! I was introduced to these fried golden rings just last year, while attending the fair with a couple of girlfriends. I made a point to get my family there, when we visited a few days later. Thick-sliced onions are dipped in local craft beer, and then battered and fried. 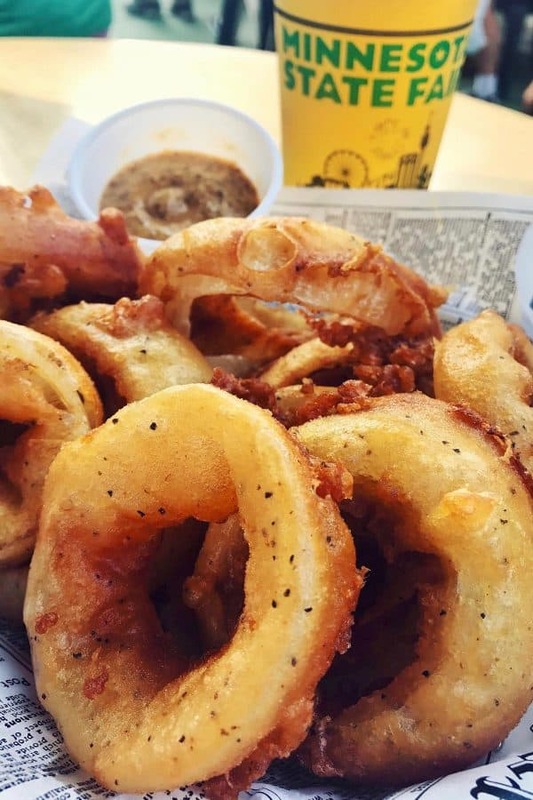 I like to dip them in the spicy beer mustard – the onion rings nearly shatter when you bite into them! These are some fantastic fried goods, my idea of the perfect onion rings. Whenever we’re in the northeast corner of the fair, and in need of something a bit more substantial to eat, you can bet we’ll be grabbing a gyro and a tall, cold lemonade. The Greek gyro sandwich features seasoned beef and lamb in a tender pita, with your choice of traditional sauces and fresh toppings. A grilled cinnamon bun sandwich filled with bacon, peanut butter, and marshmallow cream, with a good sprinkling of powdered sugar to finish it off. If you’re a fan of the Salted Nut Roll candy bar, you have to find this concession trailer. These are homemade candy bars, with a core of tender vanilla nougat dipped in caramel – and then YOU get to choose which kind of salty nuts to roll it in… traditional peanuts, cashews, or pecans. And then have it dipped in chocolate. Or not! 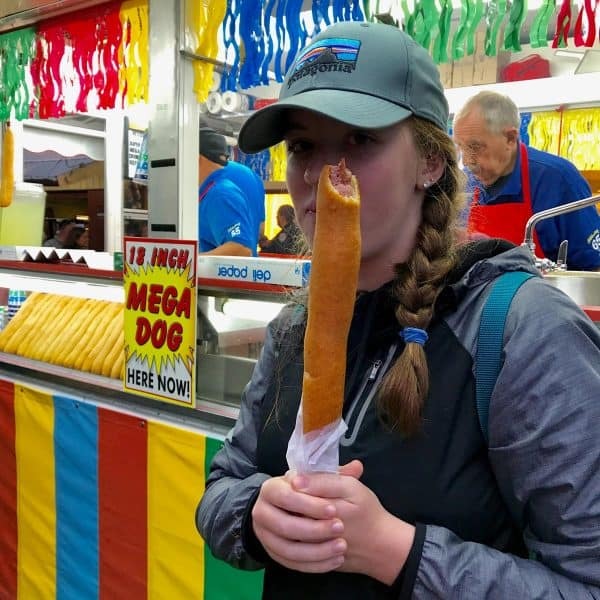 Can’t get to the fair? Try my recipe for Chocolate Dipped Salted Nut Roll Bars! This favorite of our goes way back. Thin slices of huge Idaho potatoes are dipped in a special batter and then deep fried. They’re served fresh and hot and super crispy. 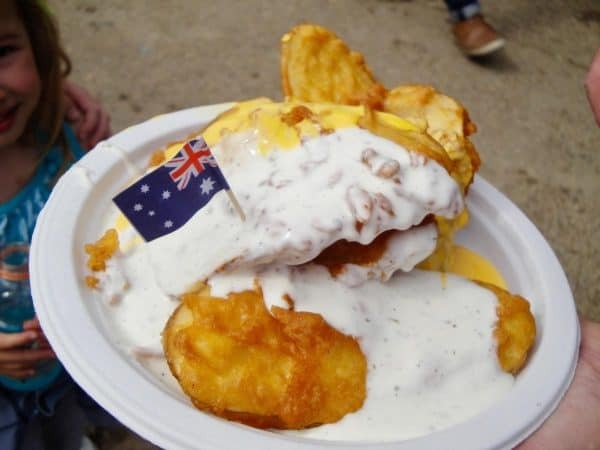 The photo shows both a cheese sauce and buttermilk ranch over the potatoes. But we usually opt for just ranch, on the side for dipping as we please. Another longtime favorite of ours, this one goes back to when Blake and I visited the fair for the first time. A super flavorful sandwich featuring thinly sliced rib-eye steak mixed with sauteed onions and green peppers. Served on a toasted, butter-dipped bun, and topped with Swiss/American cheese. This is one of my own favorites. Ice cream is made on site with the use of liquid nitrogen. It’s rich and smooth and ultra cold, with an almost chewy texture. An ice cream gimmick? Maybe so. But if I like it, I like it! 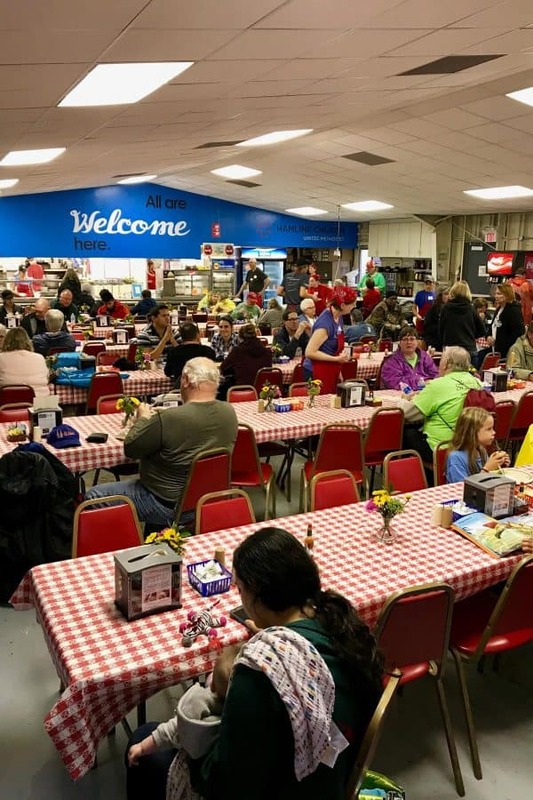 We’re pretty fond of this quaint little dining hall, staffed with the sweetest Minnesota peeps. It’s the oldest food concession at the fair, over 120 years strong! When we need to sit for a spell, or if it’s rainy or chilly, you might find us sitting at one of these checked table-clothed tables. Swedish-style meatballs with cranberries and wild rice are rich and comforting. This dinner plate comes with a choice of sides (get the mashed potatoes! ), coleslaw, and a roll. 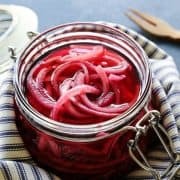 And lingonberry sauce! A must-stop each year for our daughter Hatti. She just has to get a scoop of Mini Donut Batter Crunch from Izzy’s Ice Cream. And I like to check out the latest State Fair exclusive ice cream flavor. Who doesn’t love cream cheese-filled things?! 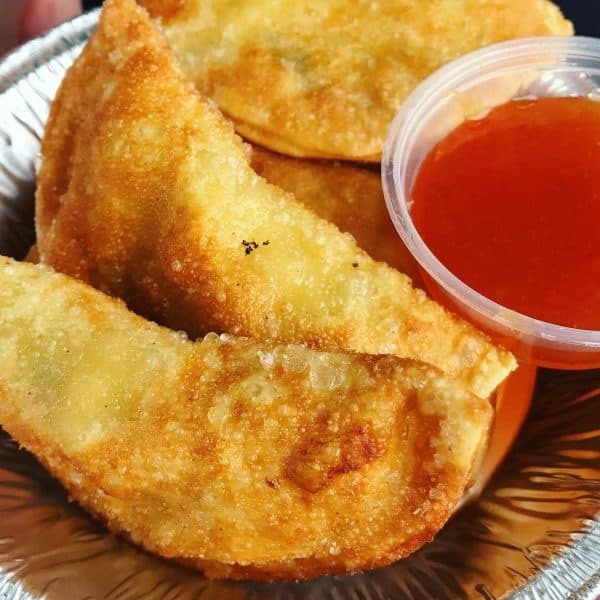 These crispy, deep-fried wontons are stuffed with duck bacon, grilled sweet corn, and cream cheese – and served with a dipping sauce. I’m a fan of truffle oil. 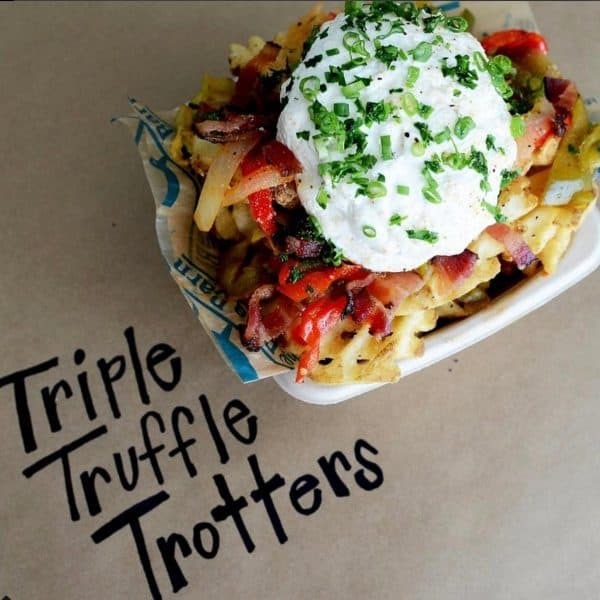 So these waffle fries topped with sliced peppers and bacon and a big dollop of truffle oil mayo was a total win! A cold juicy dill spear is a refreshing bite, when you need a break from greasy fried food. And it’s especially welcome on a hot day at the fair. 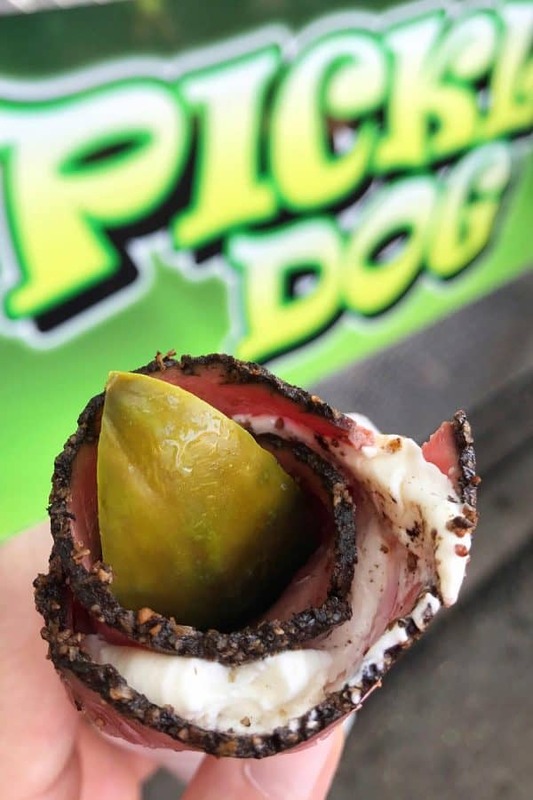 A pickle spear that’s wrapped up in a layer of cream cheese and zippy pastrami. So Minnesotan. 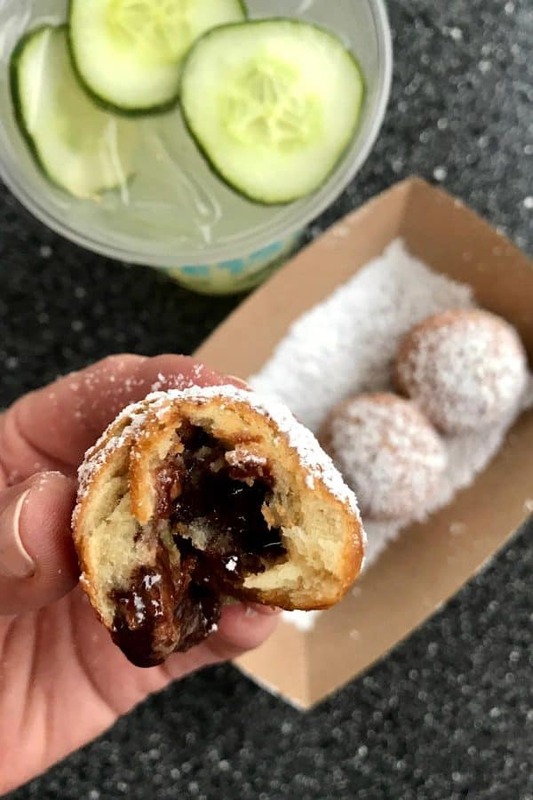 Buttermilk scone holes are filled with chocolate, marshmallow, and Nutella – and then deep-fried and sprinkled with powdered sugar. I don’t feel that “scone” is the best name for these. They’re more like a really wonderful artisan donut hole. Find it at: French Meadow Bakery & Cafe, on the north side of Carnes Avenue, between Nelson Street and Underwood Street. And last, but certainly not least, is a treat that has become iconic with the Minnesota State Fair. 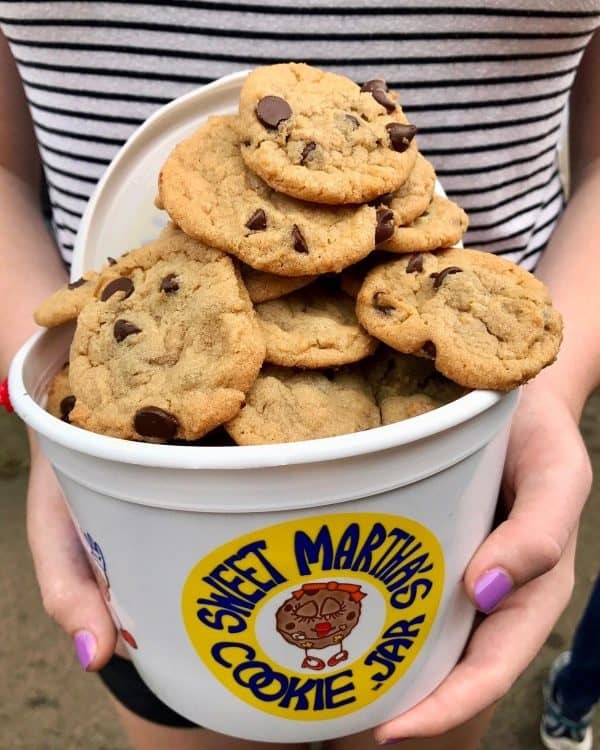 Sweet Martha’s continues to be the top-selling concession year after year, grossing more than $4 million last year. 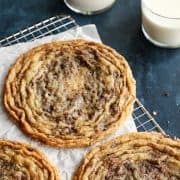 Hot and buttery chocolate chip cookies. Need I say more? We totally recommend ordering a glass or two of milk with your cookies. Find it at: Sweet Martha’s Cookie Jar – at three locations. On the south side of Carnes Avenue, between Nelson Street and Underwood Street. On the west side of Underwood Street, between Murphy Avenue and Lee Avenue. On the north side of West Dan Patch Avenue, between Liggett Street and Chambers Street. This non-alcoholic pina colada features a combination of pineapple juice, coconut juice, and ice, served in a hollowed-out fresh pineapple. 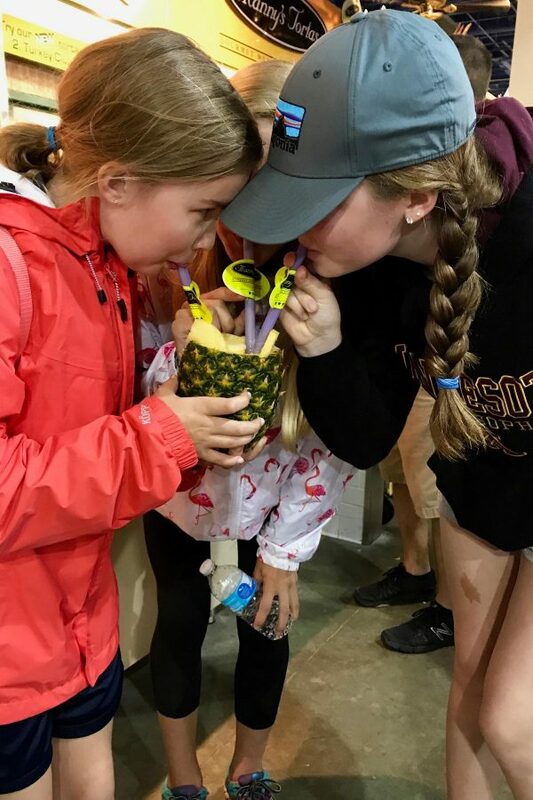 Even when you’re wearing sweatshirts and raincoats at the fair, this mocktail makes you feel like you’re on a tropical vacation! This cold brew, with sweetened condensed milk, made its debut last year. It was easily my biggest craving each afternoon. This smells and tastes just like summer. 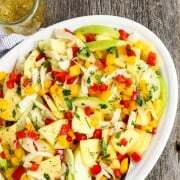 Bright and super refreshing, with a bit of herby goodness, this is a whole-family favorite. Choose white or chocolate. And then fill your glass to your heart’s content, over and over again, as much as you please! This stand is owned by Minnesota’s 3,500 dairy farmers, and operated by Midwest Dairy Association. We’re a family big on milk, so this is a must-stop. Especially when one of Martha’s Cookies stands is not too far away! Please know that this list includes brews that are found ONLY at the Minnesota State Fair. 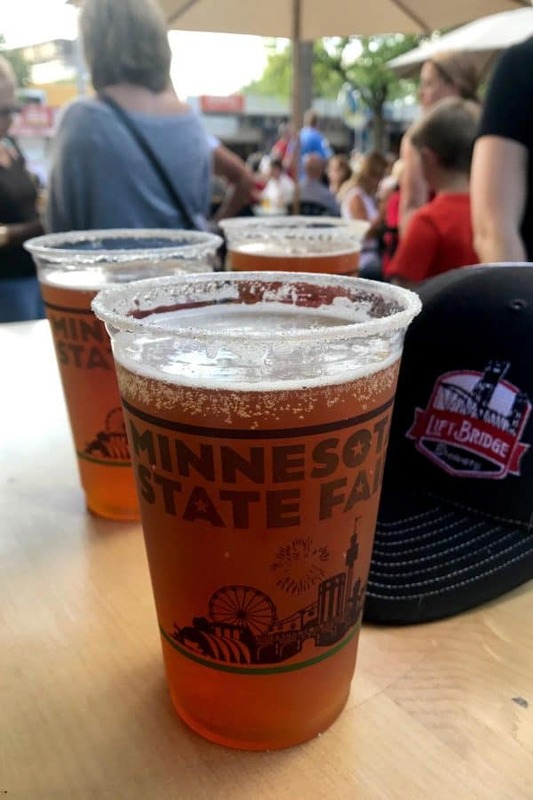 Be sure to check out this year’s Minnesota State Fair new beers! I had my reservations when it came to trying this beer for the first time. It had a great name for an exclusive buy-it-only-at-the-fair beer. But would I want to return for a second glass? Thankfully, sweetness does not overwhelm this malty beer. I find it to be an immensely joyful kind of brew, and absolutely adore the cinnamon and sugar rimmed glass. Well done, Lift Bridge Brewery! I have been loving all the sour beers coming out the past few years. And so I like to check out the Kirby Pucker Sour Series from East Lake Brewery. Flavors change up each year for the fair. Last year the brew featured grilled peaches. This year, I’m reading about strawberries and rhubarb. You know I’ll be there! 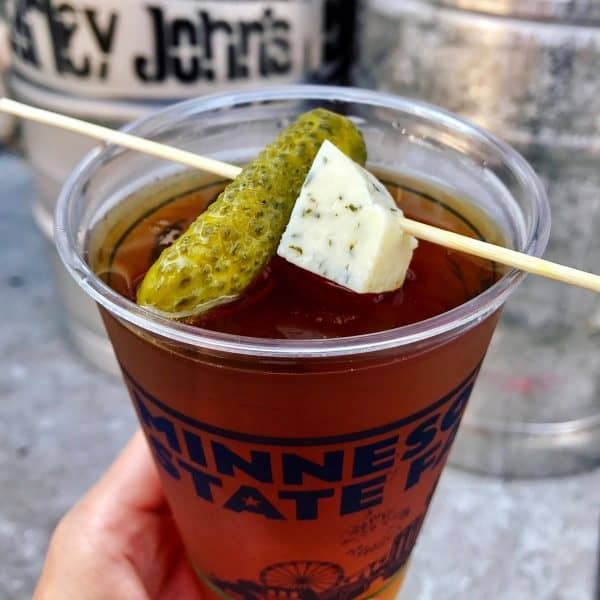 This beer from Barley John’s Brew Pub is hopped with dill and horseradish, and garnished with a chunk of havarti dill cheese and a dill pickle. Yes, there’s alot of dill going on here. I think this beer is super fun, and a perfect example of Minnesota’s playfulness when it comes to the fair. If you don’t like pickles, don’t waste your time with this beer. Also. If you do like pickles, don’t hate me if you hate this beer!! I had recommended this brew to a beer-loving friend who also likes pickles, only to find that he thought it “tasted like someone just poured pickle juice in my beer”. Sigh. On the flip side, I know WAY MORE people who LOVE this beer. 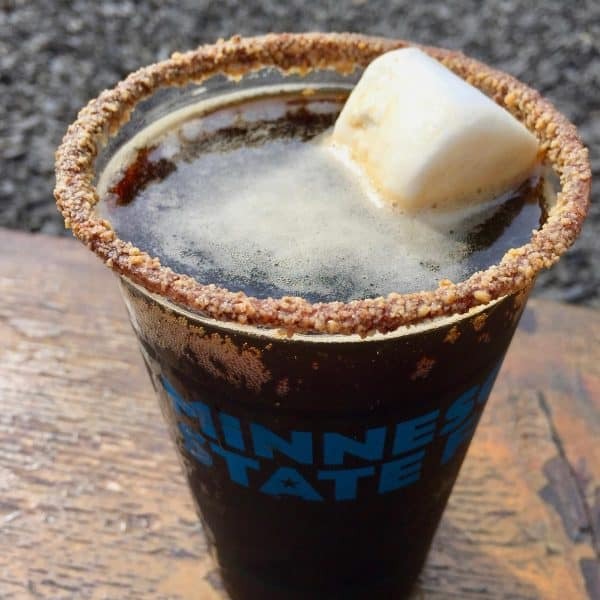 Playing perfectly into the summer theme, this brew from Excelsior Brewing Company stuffs the flavors of s’mores into a glass. A chocolate-infused porter with a touch of smoke looks extra tantalizing in a glass rimmed with chocolate and dipped in crushed graham crackers. A floating marshmallow cinches the s’mores beer win! A blend of three Minnesota-born apples – Honeycrisp, Haralson, and SweeTango – gets a little love from a fresh raspberry puree. I thought this was a great berry brew from Sociable Cider Werks. Gosh, I like this so much! 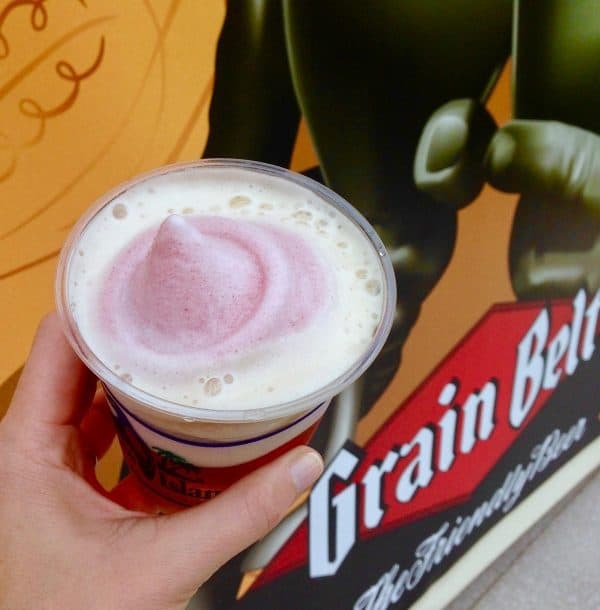 Grain Belt Premium gets a load of fresh blueberry goodness. It’s a most delicious and refreshing summery spin on a classic Minnesota beer. And the best part? The beer geniuses at August Schell Brewing Co. freeze the brew into a frozen foam that you can add to your beer. It floats right on top, keeping your beer super chilled. 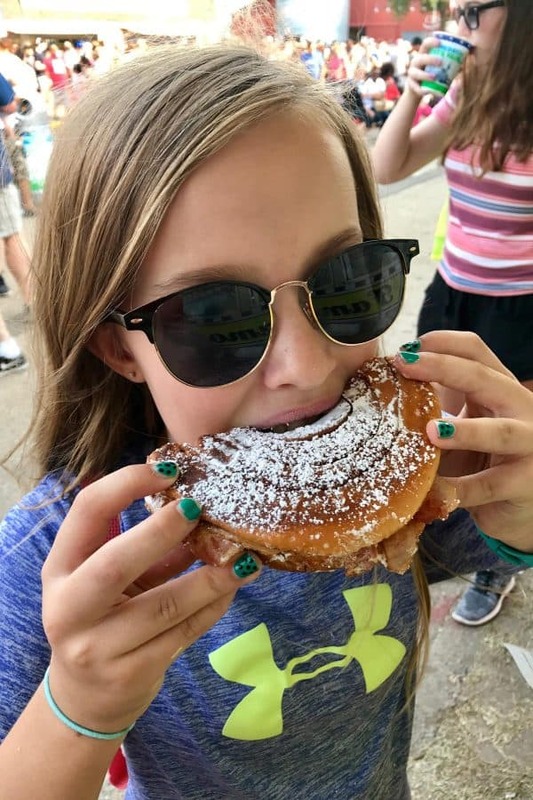 Please share YOUR best Minnesota State Fair food and drink! 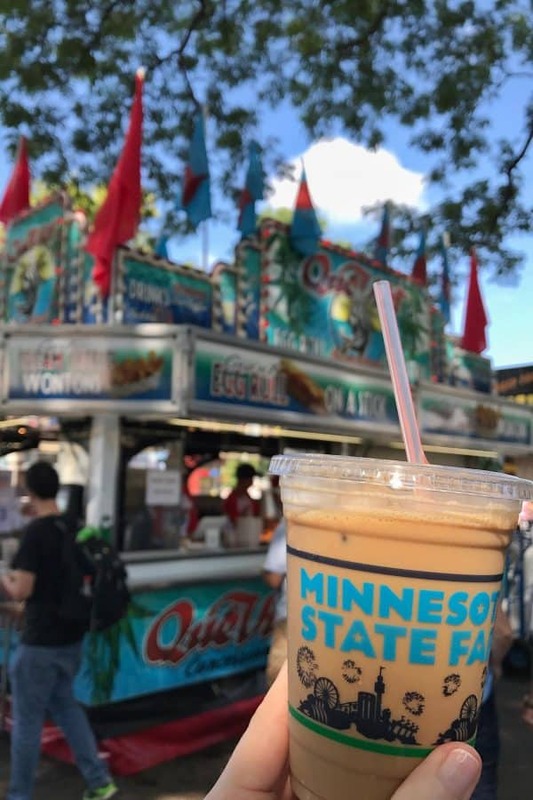 If you have any Minnesota State Fair favorite foods and/or drinks that you think we need to try, please leave a comment below. Thank you! Wow! What an awesome post! I’m from Missouri and haven’t heard much about the Minnesota State Fair. You make it look as good as Walt Disney World. I’m definitely putting this on our travel list! Thanks! There are many people who have this fair on their travel list – I hope you make it here some day!! Last year was the first time I tried walleye cakes at Giggles. They are heavenly and have made it on to my “must eat while at the Fair” list. Thank you, Michelle. Seems like I really should try that – I do like walleye! Cranberry wild rice meat balls sound like a yummy fall appetizer. It sounds like you had a great time! This was so perfect when we went on a chilly, rainy day. Total comfort! It’s fun to hear someone’s favorites! I definitely want to try the turkey and the pineapple float sounds perfect on a hot day! We choose our day based on the weather and on when Tonic Sol Fa will be playing at the Leinie Lodge. Hope you have another great time this year! I’ll have to check into that at the Leinie Lodge – always a great place to sit and relax under the shade trees!